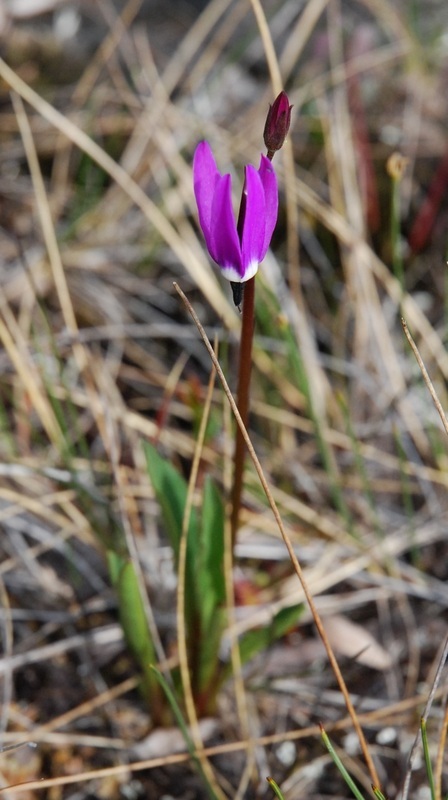 The tall mountain shootingstar is a 10-60 cm tall perennial wildflower. Its lance-shaped leaves, measuring 5-50 cm long, attach at the base of the stem and may have smooth or partially toothed edges. Its flowers, which can be varying shades of purple or pink (or rarely white or light yellow) hang down from the top of the stem, with 4-5 backwards-swept petals. The petal bases join together into a short, yellowish or creamy white tube with a reddish ring that may or may not be visible. The stamens point down below this tube; they range from reddish to purplish-black, and are loose or fused slightly. Click here to see a close-up of the flower for these details. This species arises from rhizomes, or underground stems, and is usually found grouped in large clumps. 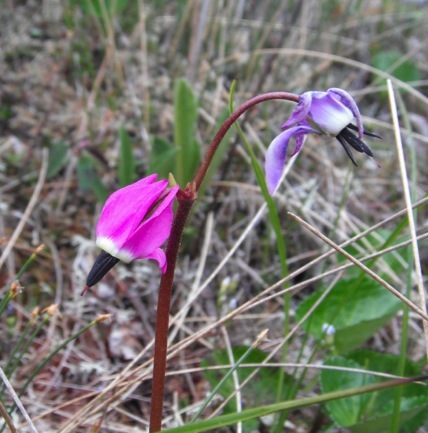 The tall mountain shootingstar is found from sea level to high elevations, and grows in wetter areas like moist meadows, by streams and pools, swamps and bogs, and shorelines. It is a common species in southern and coastal BC. Its range stretches along the coast from Alaska to California, and east to Montana and Idaho. Other shootingstar species are similar in appearance to the tall mountain shootingstar. 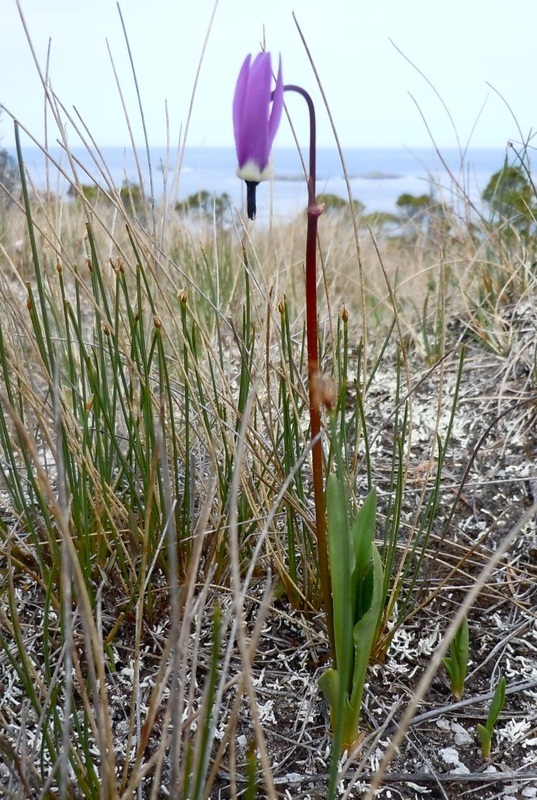 The leaves of the few-flowered shootingstar (Dodecatheon pulchellum) are more rounded and less pointed than those of the tall mountain shootingstar. The area where the petals join into a tube is different as well: on D. pulchellum this area is a yellowish or white tube with yellow, usually with a purple wavy ring. The stamens are joined below this point in a yellowish or orangish tube. These differences are clearly visible when this photo of D. pulchellum and this photo of D. jeffreyi are compared. The broad-leaved shootingstar (D. henderosii) is another similar species, but doesn't usually get further north than southwestern BC. It has egg- or triangular-shaped leaves, and the tube connecting its stamens is reddish-purple. The name 'shootingstar' comes from the way the petals trail behind the stamen tube like the tail of a shooting star. John Jeffrey travelled from Scotland to Victoria, BC under the Hudson's Bay Company. He worked all along the west coast from BC to California. Of his work, the tall mountain shootingstar, or Jeffrey's shootingstar, is one of his best known collected specimens. 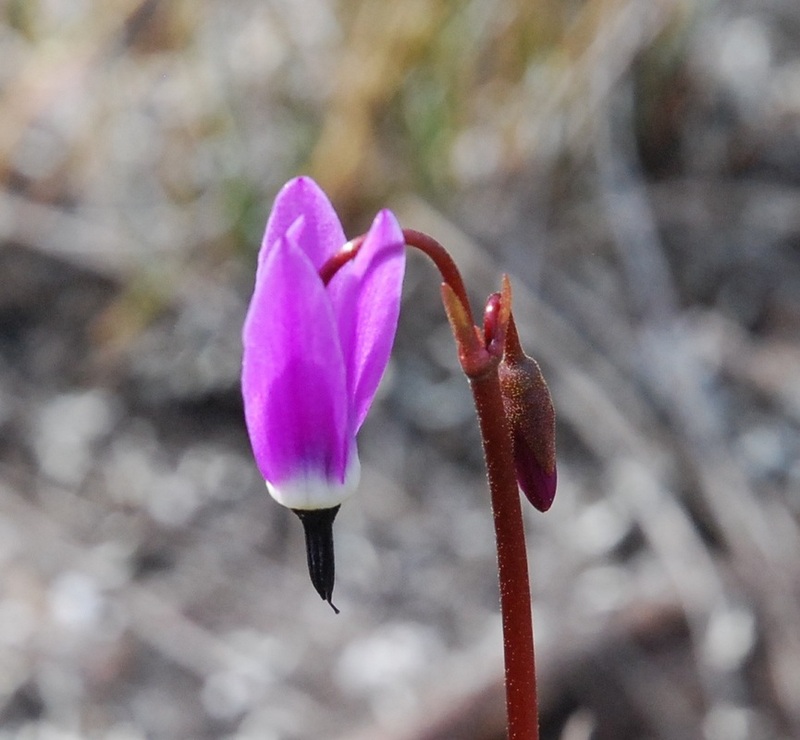 Dodecatheon jeffreyi Van Houtte subsp. jeffreyi. In Klinkenberg, Brian. (Ed.). E-Flora BC: Electronic Atlas of the Plants of British Columbia. Lab for Advanced Spatial Analysis, Department of Geography, University of British Columbia, Vancouver. Accessed 12/08/2013. Pojar, J. and MacKinnon, A. (1994). Plants of Coastal British Columbia, Revised. Vancouver, BC: Lone Pine Publishing. P. 324.